I've come to the realization that having faith means you have to accept that you may never know "why" things happen. Well, it ain't easy! So, my hope is that writing about my feelings will help me make as much sense of life as I can! 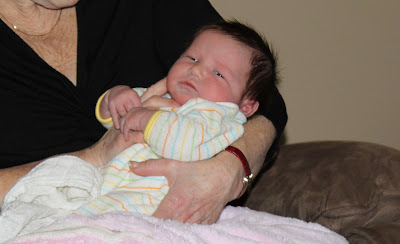 Now, while Mommy is working on her photography skills and has yet to capture a picture of Alana where she doesn't look sad or angry, Tina at Life is a Highway Photography has mastered the art of taking newborn pictures!! Please check out her sneak preview of Alana and, if you would like, leave a comment after the photos (50 comments gets us a prize and 100 comments gets us a better prize!). I cannot wait to see the rest of the photos because I'm going to wear out my computer screen (if such a thing was possible) looking at the first one! My daughter is a week old today!!!! Oh, blog world, I am so very sorry that I have let a whole week go by without announcing the birth of the love of my life!! For some reason, I was unable to get online at the hospital, even though they have wireless, and with other things going on, I just wasn't able to troubleshoot it. Alana Anna Aaryn M(lastname) was born on Wednesday, 12/9, at 12:25 in the afternoon via c-section. There is no way I could adequately put into words what I felt at that moment, so, I won't even try, at least not today when I'm a ball of hormones. Let's just say that it's like nothing I ever knew possible! We ended up spending an extra night in the hospital for two reasons. The blood pressure issues I had in the weeks leading up to delivery continued after and, in fact, got worse. I was constantly monitored for preeclampsia, but, in the words of the doctor, on paper, I was perfect. All of my results were, not just good, but perfect. I just have this moderately high pressure that they can't seem to get completely under control. I'm under the care of a hypertension doctor now and they have adjusted my medicine a couple of times and we're watching it very closely. But, having the spend an extra night in the hospital was actually a blessing in disguise because, the night before we were supposed to leave, Alana developed a fever and was sent to the NICU. Imagine how scary it is when a doctor comes into your room at 3:00am and tells you that your perfectly healthy baby has a fever, is being taken to the NICU for testing, and may need a spinal tap! Thankfully, by the time they admitted her to the NICU, her fever had dropped and never went high again. All of her test results came back normal, no spinal tap was needed, and they think the high reading could have just been a fluke. They told me she would have to stay for 48 hours after being admitted, which would have been Tuesday, while I was going to be released Monday. I know it would have only been one night, but, the thought of leaving without her was devastating. But, thanks to a wonderful NICU pediatrician who stayed on top of all of her negative test results, she was released with me and we came home Monday night!!! Yesterday was a whirlwind, so, today is really the first day I've had time to get online and post. I hope you'll all forgive me and I promise to get a couple of pictures up very very soon!!! She is so incredibly gorgeous and I am more in love than I ever knew possible! Every single time Glenn and I walked out of a hospital over the last four years, and sadly, there have been way too many times, I said to him "next time we walk out of a hospital, we should be bringing home our baby". It didn't happen for a very long time, but, Monday night, I finally walked out of a hospital with my baby....and, after seeing her for the first time, it was one of the most emotional moments of my life!!! After three trips to L&D for extended monitoring, and three trips back home without the baby, the time has finally arrived! I am having a baby tomorrow! OK, I have a perinatologist appointment in an hour and will likely be sent for monitoring because my blood pressure is still really high. The big question is whether they will keep me and deliver today, keep me and deliver, as scheduled, tomorrow, or send me home like every other time. So, yes, there is a chance I'll have the baby today, but, if not, I am having a baby tomorrow!!!! I have so much I want to say, but, I'm going to save it until after she is here and we are both safe and, G-d willing, healthy. So, I've been on bedrest for a week and a half now. And, honestly, it hasn't been awful, although I can't imagine how people do it for months! Then today happened. We lost our power around 6:30 this morning. That meant no TV, no phones (can't find the non-cordless phone), and no internet. Plus, because of the high BP induced headache, it was putting a little too much strain on my eyes to try to read, so, I couldn't do that, either. So, what did I do? I went back to sleep! Nice!! Spoke to Glenn on my cell at 9. Checked email, etc... Around 10:00, I noticed that my cells (both personal and work) weren't working, either!! So, I had no contact, whatsoever, with the outside world!!!! Thankfully, the power came back around 12:30. Whew!!!! In other news, we had another false alarm this week. I saw the MFM on Tuesday for my weekly stress test and ultrasound. They had a very hard time keeping this kid on monitor and, when they got her, it seemed as if her heart rate was dropping very low. So, back over to the PET unit for monitoring I went. The doctor told me not to eat anything, thinking this would probably be it. And, why not?! I was 38 weeks exactly. My little monster was estimated to be 8lbs 11ozs! I'm still struggling with the blood pressure issues. And, now this. Just felt like time, right?! Nope. They proceeded to hook me up and, for 2+ hours, the baby looked, as they put it, "gorgeous". So, once again, I was released on bedrest. Ugh!! I want this baby out of me!!!! Yesterday, my BP was tracking high even when laying down. I had an OB appointment in the afternoon and the doctor didn't want to send me over for monitoring again, so, she decided to increase my meds a bit and I have to go back for a BP check tomorrow. It's still tracking on the higher side today, so, we'll see what happens. At this point, I'm just looking at my scheduled date of 12/9 and if they decide to deliver her sooner we'll just be very pleasantly surprised. We are ALL so very ready!!!!! Oh, except for the baby, who seems to be very happy and content inside of me! Hi, thanks for visiting! I'm very open about my long struggle with infertility. My theory is that, by putting yourself out there, you can help others and learn from anyone willing to open up to you! So, feel free to ask me anything you want and tell me about your experiences! Hey, I'd like to follow along! May '08 - Met with a new RE and put a gameplan in place to do IVF #6 in August! December '09 - our beautiful daughter was born, making us a family of three!